Although Boone Central/Newman Grove entered Friday’s 2016 regular season finale with at least a shot – a very long shot – at the Nebraska state playoffs, more realistically the Cardinals knew their contest against visiting Grand Island Central Catholic (1-8) was about looking inside themselves and finishing the campaign on the right note. Boone Central/Newman Grove accomplished that, storming back from an early GICC touchdown to defeat the Crusaders 35-13 and finish with a 5-4 season record. The Cardinals took a series to get a feel for GICC’s physical style, then completely dominated the remainder of the game while amassing a 430-123 advantage in total yards. Boone Central/Newman Grove answered the Crusaders’ opening touchdown in two plays, then rode a pair of touchdown passes by Dylan Gentrup to a 21-7 halftime lead. A few miscues led to a scoreless third period before Gentrup put the Cards up 28-7 with his third TD pass early in the fourth. Gentrup completed a superlative breakout junior season by completing 12-of-17 aerials for 244 yards and rushing 23 times for 112 yards. He also had a 60-yard bolt on the kickoff return following GICC’s early score. Although the Cardinals were disappointed by missing the Class C1 playoff field, Hudson was pleased with the way his squad finished the season against a difficult schedule that included four playoff qualifiers (O’Neill, Norfolk Catholic, Scotus, Lakeview) and the first team out of the bracket (Ord). Grand Island Central Catholic had a tough campaign in Bob Fuller’s first season as coach, but the Crusaders were competitive in nearly every game and brought a tough, physical outfit to Albion that Hudson knew would battle despite its record. 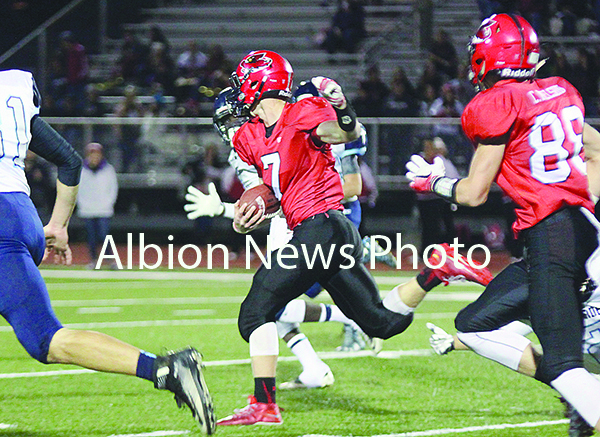 Fans may have had a few flashbacks to the powerful Scotus Wing-T rushing attack on display the previous week, as GICC took the opening kickoff and ground 60 yards in 13 rushes – eight by 200-pound FB Jonah Bales – to score. Bales crashed over from the two to cap the six-minute march and give the Crusaders the early lead. It was fool’s gold for the visitors – and shortlived. Gentrup gathered in the ensuing kick and dashed 60 yards to the GICC 31 and, on first down, junior halfback Levi Krueger burst straight through the middle of the Crusader defense and raced 31 yards to paydirt. Will Frey’s PAT tied the score at 7-7. From that point, the Boone Central/Newman Grove defense put the clamps on and halted eight straight GICC possessions – six punts, two interceptions – without surrenduring additional points. Following the first of those punts, Gentrup directed a 77-yard nine-play scoring drive that carried into the second quarter, firing eight yards to Cody Nelson for the touchdown. Frey again tacked on the PAT. The Cardinals blocked GICC’s next punt and BC/NG was off to the races again.Gentrup finished a 61-yard foray with a 30-yard touchdown pass to Derek Stuhr and Frey gave the Cards a 21-7 lead.